BBC Strictly Come Dancing’s all-time favourite professional, Robin Windsor, has decided to hang up his dancing shoes, after a long and successful career - and he plans to go out with a bang! Robin, who was part of the hit TV show for five years - whose celebrity partners included Patsy Kensit, Anita Dobson, Lisa Riley, and Deborah Meaden - has created an action packed and energetic show to match his personality. Robin is no stranger to touring, having been involved in many shows over the years, most recently ‘Dance to the Music’, with former Strictly Come Dancing professional Kristina Rihanoff. However, he feels that now is the right time to concentrate on other things. The All Fun Farewell Tour will take Robin across the country, with 29 shows over five weeks, with plenty of fun, cheeky chat, sparkles, and superb dancing. The show will be at Louth’s Riverhead Theatre on November 18, at 2.30pm and 7.30pm. A limited number of VIP tickets will be available to meet Robin before the show and have photo opportunities. 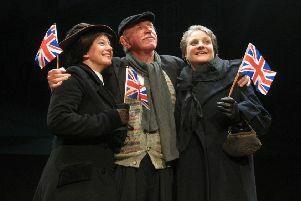 Bookings at www.louthriverheadtheatre.com or call 01507 600350.